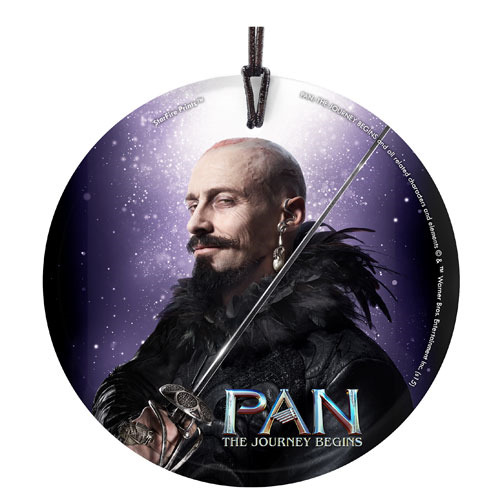 Shopping for Peter Pan Holiday Ornaments? Escape to the magical world of Neverland with Peter Pan and experience the adventure of a lifetime! This beautiful hanging glass print features Blackbeard and comes with a display ribbon. Translucent yet vibrant with color, the 3 1/2-inch diameter Pan The Journey Begins Blackbeard StarFire Prints Ornament is designed to capture the natural light, making it a true piece of art. The glass is scratch and fade resistant, and it arrives ready for display. Made in the USA. From Warner Bros. Pictures, comesPan, a live-action Peter Pan feature directed by Joe Wright. Offering a new take on the origin of the classic characters created by J.M. Barrie, the action adventure follows the story of an orphan who is spirited away to magical Neverland. There, he finds both fun and danger, and ultimately discovers his destiny - to become the hero who will be forever known as Peter Pan.